Millennia-old canine DNA has thrown a new twist into the debate over the origin of dogs — supporting the view that European hunter-gatherers were the first to domesticate the species. The focus on ancient DNA provides "a new perspective on dog origins," Robert Wayne, an evolutionary biologist at the University of California at Los Angeles, said in a Science interview. "Really to our surprise, it suggests that the origin of modern dogs was from Europe, not from the Middle East or east Asia — and that it occurred about 20,000 years ago," said Wayne, who is the senior author of a study published in Friday's issue of the journal Science. The findings open up a new way to address the key questions surrounding the origins of "man's best friend": When, where and how did humans domesticate dogs? The "when" varies from 12,000 to more than 30,000 years ago. Scientists have pointed to the Middle East, Africa, Eurasia and east Asia as the "where." And there are two leading scenarios for the "how": Some favor the view that wolves co-evolved with humans to give rise to ancient hunting dogs ("Hunter's Helpers"). Others suggest that dog domestication was facilitated by the rise of agriculture and the resulting heaps of trash that could be scavenged (portraying dogs as "Dumpster Divers"). The new results support the "Hunter's Helper" hypothesis. To trace dog ancestry, Wayne and his colleagues collected samples of mitochondrial DNA from the remains of 10 ancient wolflike animals and eight doglike animals, ranging in age from 1,000 years to 36,000 years ago. They also took samples from 77 modern-day dogs, 49 wolves and four coyotes. Then they grouped together the DNA signatures into an evolutionary tree diagram. The groupings of modern-day dogs were most closely related not to the modern-day wolves, but to the ancient canines from Europe. That led the researchers to conclude that dogs were derived from a now-extinct wolf breed sometime between 18,000 and 32,000 years ago — before the rise of agriculture, when hunter-gatherers roamed Europe. The results came as a surprise to Wayne because just three years ago, he was part of a team that determined dogs probably originated in the Middle East. The ancient DNA tells a radically different tale. Wayne now suggests that wolves may have started going down the domestication route by following human hunters on the trail. "One can imagine wolves first taking advantage of the carcasses that humans left behind — a natural role for any large carnivore — and then over time moving more closely into the human niche through a co-evolutionary process," Wayne said in a UCLA news release. Wayne thinks the earlier DNA results pointed to the Middle East because of interbreeding between dogs and wolves during later stages in domestication. "As hunter-gatherers moved around the globe, their dogs trailing behind probably interbred with wolves," he said. The researchers also say their findings imply that the oldest dog bones ever discovered — a 33,000-year-old skull from Russia and a 36,000-year-old skull from Belgium — "may represent aborted domestication episodes." In other words, humans tried multiple times to domesticate dogs, and the earliest efforts apparently fizzled out. In the Science paper, Wayne and his colleagues acknowledge that their findings don't tell the full story of dog domestication. For one thing, scientists can glean only limited genetic data from mitochondrial DNA, which resides in tiny energy-producing structures outside the cell's nucleus. DNA from the nucleus itself would provide a more complete picture, but it's hard to extract high-quality nuclear DNA from ancient specimens. Also, the researchers weren't able to find mitochondrial DNA samples from ancient canines in the Middle East or China. "In fact, no ancient dog remains older than 13,000 years are known from these regions," they wrote. For those reasons, "one has to be a little bit careful about interpreting this data," said Erik Axelsson, an evolutionary geneticist from Sweden's Uppsala University. Axelsson wasn't involved in the Science study, but he was part of a team that found evidence of canine adaptation to starchy diets thousands of years ago. That study, published in the journal Nature, supported the "Dumpster Diver" hypothesis for dog domestication. "I think that we just don't have enough data to say it's one or the other hypothesis right now," Axelsson told NBC News. "I think it's still an open question, but this is certainly an important step. ... It seems that ancient DNA might be a way forward in resolving the origin of dogs." Wayne suspects that follow-up research will flesh out the central findings laid out by the Science study. "This is not the end-story in the debate about dog domestication," he said, "but I think it is a powerful argument opposing other hypotheses of origin." Update for 8:30 p.m. ET Nov. 14: University of Arizona psychology professor Clive D.L. Wynne says he doesn't think the latest findings settle the debate over domestication. "I don't think the geneticists have the reliable evidence to date the origin of dogs," he told NBC News. Wynne, who is also director of research for Wolf Park in Indiana, pointed out that geneticists were saying back in 1997 that dogs originated more than 100,000 years ago. (Wayne was one of the researchers behind that study.) Wynne still favors the "Dumpster Diver" hypothesis, and cites archaeological evidence indicating that dog domestication took hold when humans settled down in communities sometime around 10,000 to 15,000 years ago. Were first dogs our best friends, or vermin? 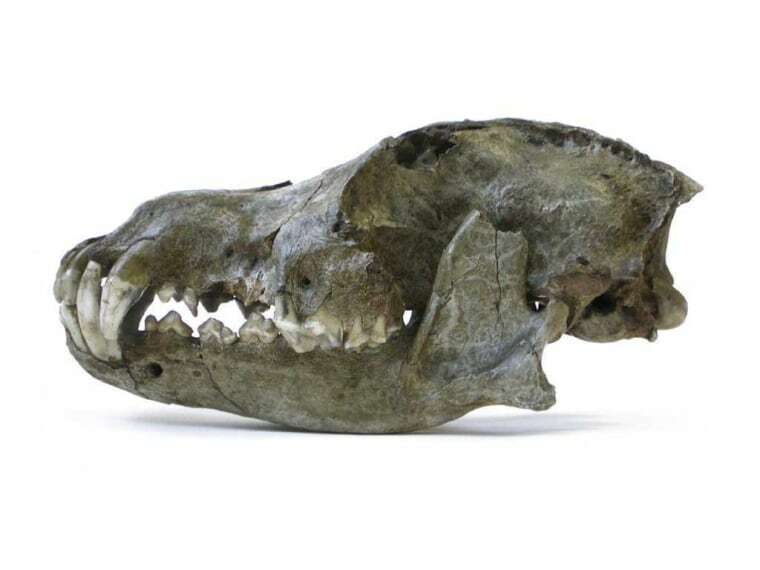 DNA identifies big dogs from 30,000 B.C. Wayne is among 31 authors of the Science paper, titled "Complete Mitochondrial Genomes of Ancient Canids Suggest a European Origin of Domestic Dogs." The first author is Olaf Thalmann of Finland's University of Turku.